There will always be Hope, for this iconic rhino will live on in everyone’s hearts and in Saving the Survivors mission of Creating Hope from Hurt. It is with heavy hearts and great sadness that Saving The Survivors has to share the devastating news that our beloved White rhino cow, Hope, is no longer with us. She was found yesterday late afternoon without life in her boma where she has been cared for since March this year. We don’t know yet what dimmed Hope’s light and we are left with a huge ‘WHY?’ today. The cause of death looks to be a bacterial infection of her small intestine, and we have requested further tests to shed light on this immense tragedy. 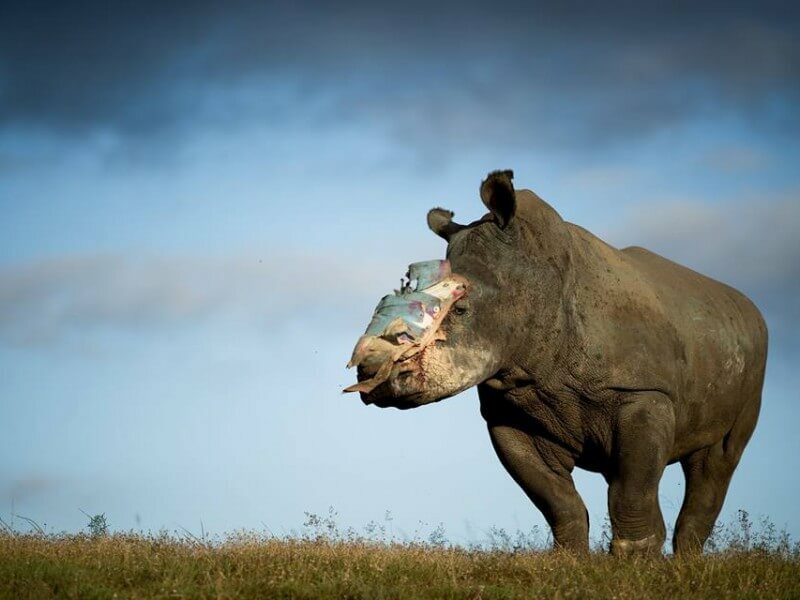 This courageous rhino has been the face of rhino poaching survivors since she survived a brutal attack in the Eastern Cape at the end of April last year. Wandering alone in the bush for days, deeply hurt and with half her face hacked off, she survived against all odds. It was no wonder then, that she was christened Hope and became a worldwide ambassador for her species. Her healing was described as miraculous and she continued to show a fighting spirit, bar none. Thank you to all the veterinarians involved in treating Hope, her caretakers and everyone else that contributed to Hope’s wellbeing! 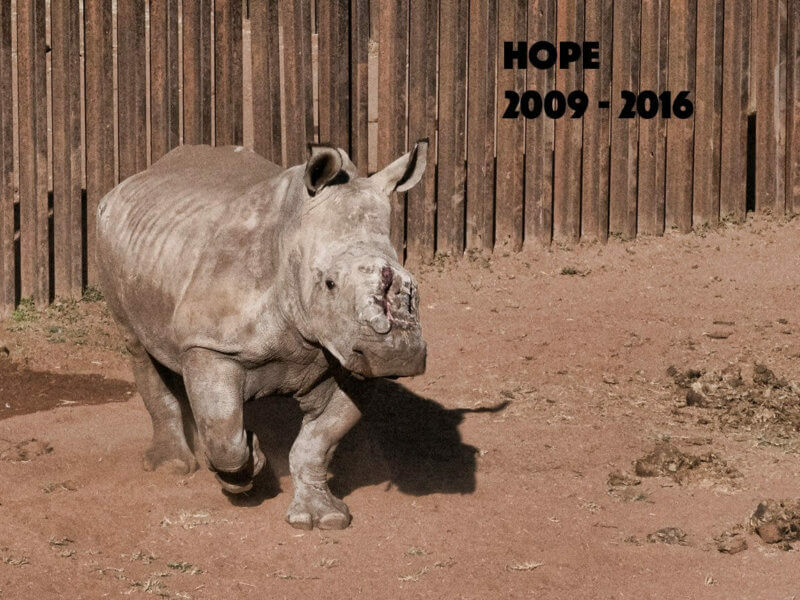 On the 8th of June 2015 “Hope”, the rhino Survivor, underwent her third procedure to repair the catastrophic damage done to her by poachers who left her for dead. Hope, the four year old white rhino, who has become the international symbol for the rhino crisis, was treated by Saving the Survivors, a team of vets dedicated to saving the victims of poaching. 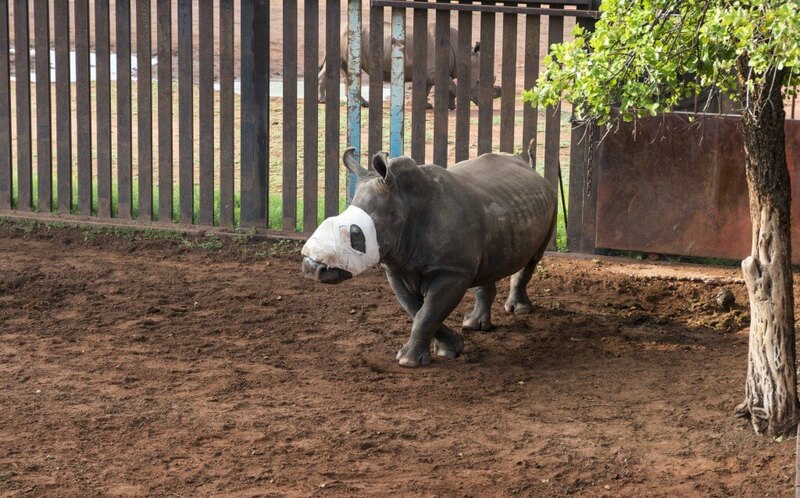 “The previous procedure involved removing the first face shield which had come loose after she rubbed her face up against the boma (enclosure). Leaving this wound exposed has inhibited the healing process by allowing these tissues to dry out and so we took the decision to place a new shield over the wound to keep it moist and assist with the repair process,” explained Saving the Survivors. Today’s procedure and her journey ahead demands a huge team effort and our thanks go out to every member of the public who has been moved to share Hope’s story. Without your voices her struggle would be a silent one. Our thanks must go to The Wilderness Foundation, Medivet UK, Dr Johan Joubert and his team on Shamwari Game Reserve, including his incredible ground crew, led by Bruce Main, who have provided exceptional support through all our procedures with Hope, and for dnata4good for their ongoing support of STS. “Whilst we remain positive that she will recover, we have to be realistic in our expectations of the timeframes required for Hope’s healing process. It is going to be a long journey and she has to be closely monitored at all times especially in these early stages, for any complications. From our experience we anticipate it will take at least a year to a year and a half before a full recovery can be expected. What Hope is teaching us now is invaluable. We can draw from her treatment when treating other victims of poaching with severe facial wounds. We must be patient and give her body time to heal. We are providing her with the best medical care we have and making her as comfortable as possible,” says Marais. The Eastern Cape has suffered major losses to poaching in the last 20 days. On the 30th of April this year, two white rhino, an adult cow her young calf, were poached at Lombardini Game Farm both animals were shot and killed with a large calibre rifle. The horns of the cow were removed. The senseless killing of the two month old calf was disturbing as the poachers left the calf’s horn intact, but shot him anyway. Only a week later Lombardini was to suffer another loss when a sub adult white rhino bull was shot, killed and the horns removed, a four year old rhino heifer (female) was missing. She was found in dire condition a couple of days later. Her face was badly mutilated; both horns were savagely hacked off. Although she was still alive, there was serious damage to her face. 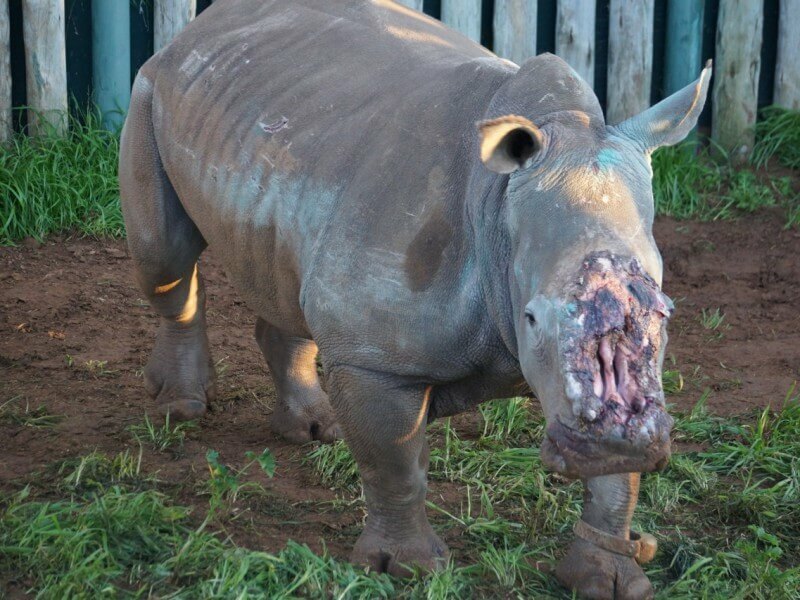 In the process of removing her horns, the nasal bone was badly fractured and a section completely removed, exposing the sinus cavities and nasal passage, added to that there was a severe infestation of maggots. It is assumed that she was immobilised (darted) with an opioid drug and left to die. Against all odds she survived. 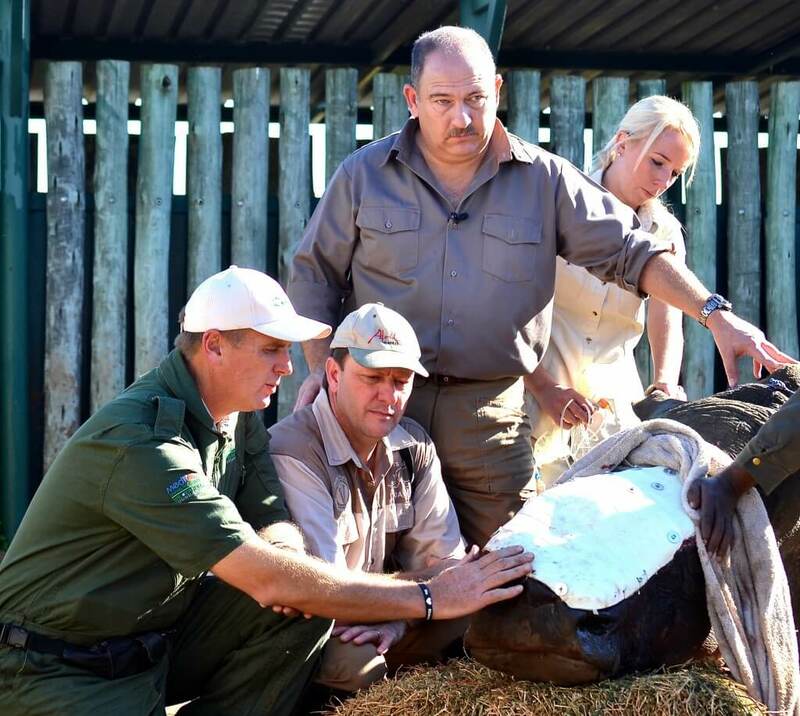 Various Eastern Cape wildlife veterinarians assisted with supportive veterinary treatment and translocated her to holding facilities at Shamwari Game Reserve. Saving the Survivors travelled to Shamwari to assess her condition, upon which it was established that she could indeed be saved and undertook major surgery on Monday 18th May. The damage to her face was severe. The wounds had to cleaned, lots of dead and damaged tissue removed and an artificial cast fitted to cover the extensive wounds. The cast is to prevent damage while looking for food as well as to prevent bacterial infection and maggot infestation. After surgery she was released from the boma (pens) into a small camp where she can be closely observed, and feed on natural vegetation.